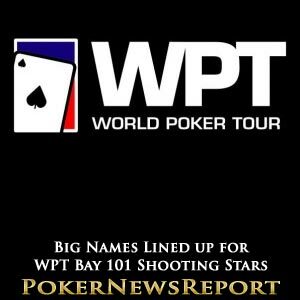 The line-up for the upcoming World Poker Tour (WPT) Bay 101 Shooting Stars championship has been announced – and it’s one heck of a stellar-packed list. Already confirmed for this year’s $9,500+$500 buy-in event are reigning champion Alan Sternberg, as well as the likes of Team PokerStars Pros Daniel Negreanu, Liv Boeree, Joe Hachem, Bertrand ‘ElkY’ Grospellier, Jonathan Duhamel, David Williams, Barry Greenstein and Jason Mercier. If those nine superstars are not enough to convince you that this will likely be the most impressive line-up you’ll see all year, then consider some of the other big-name poker pros involved. How about Phil Hellmuth? Or Antonio Esfandiari? Then there’s Will ‘The Thrill’ Failla, Team PartyPoker Pro Tony G, Fabrice Soulier, Todd Brunson, Eugene Katchalov, Jennifer Tilly, Phil Laak, JC Tran, Ben Lamb, Yevgeniy Timoshenko, Erick Lindgren, Michael Mizrachi, Lock Poker Elite Pro Chris Moorman, Men Nguyen, Erik Seidel, Scott Seiver, Team PartyPoker Pro Mike Sexton and Sam Stein – to name just a select few. All those previously named will, of course, have a $5,000 bounty on their heads when the action kicks off at the Bay 101 Casino on Monday, March 5, and ends on Friday the ninth. In total, 49 pros in the field will be worth $5,000 to the player who knocks them out, and also includes the likes of Allen Bari, Freddy Deeb, Andy Frankenberger, Matt Giannetti, Jennifer Harman, Maria Ho, John Juanda, Kathy Liebert, Dwyte Pilgrim and David ‘Chino’ Rheem. As well as the bounties, there is a $10,000 bonus up for grabs for the chip leaders after Day 1a and Day 1b, so there is plenty on offer – even for those who don’t make the money. New York State’s Sternberg picked up $1,039,000 for taking down the event last March in San Jose after defeating fellow American Steven Kelly in their heads-up battle. The runner-up, from California, left with a nice little bundle of cash, too, though, with Kelly pocketing $595,300, while Las Vegas-based Mike ‘The Mouth’ Matusow earned $369,800 for securing third place. Sternberg’s victory was a true thriller as he also had to see off the likes of Indian star Vivek Rajkumar – who finished fourth for $295,800 – as well as Sexton (sixth for $148,000), Tyler Reiman (seventh for $73,900) and Danny Nguyen (eighth for $73,900) at the final table.